A plant ecologist measures lodgepole pine seedling growth in Yellowstone National Park in Wyoming. 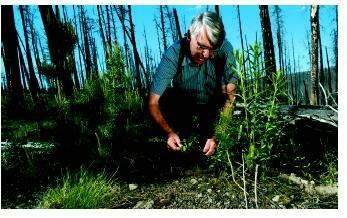 Seven years after the fire of 1988, there were ten times as many seedlings in the area than before the fire. dominated by tree species with thick bark, especially oaks and pines. The fires kill invading tree species with thin bark while allowing oak and pine to survive.